The Canadian Shield is the largest region in Canada, covering almost half of the country and it is also one of the largest geologic continental shields in the world. This plateau covers most of Greenland and a portion of the northern United States as well. It extends for 8 million square km and is centered on the Hudson Bay. This shield is estimated to be made two billion years ago. It is mainly composed of granite and has a thin layer of soil. A total of four different mountain ranges rise from the Canadian Shield. The Precambrian rocks of this shield are estimated to be around 570 million years old. The Canadian Shield is also known as the Precambrian Shield and the Laurentian Plateau. The highest points of this shield are located on Baffin Island and in northern Labrador. 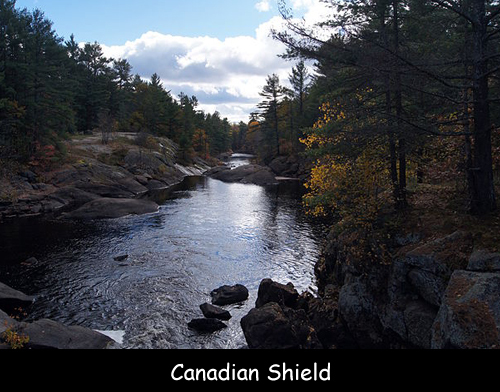 This shield is also home to the world’s largest Boreal Forest. This region has a long volcanic history and it is mainly composed of igneous rocks. This shield is estimated to be approximately 2.5-3.5 billion years old which makes it the oldest. The area is covered by forests. Tundra typically prevails in the northern regions. There are five physiographic provinces located in the shield; Hudson, James, Kazan Region, Davis, and Laurentian Upland. The shield is almost circular in shape if the Greenland section is included. Declan, Tobin. " Fun Facts for Kids about Canadian Shield ." Easy Science for Kids, Apr 2019. Web. 25 Apr 2019. < https://easyscienceforkids.com/canadian-shield/ >.